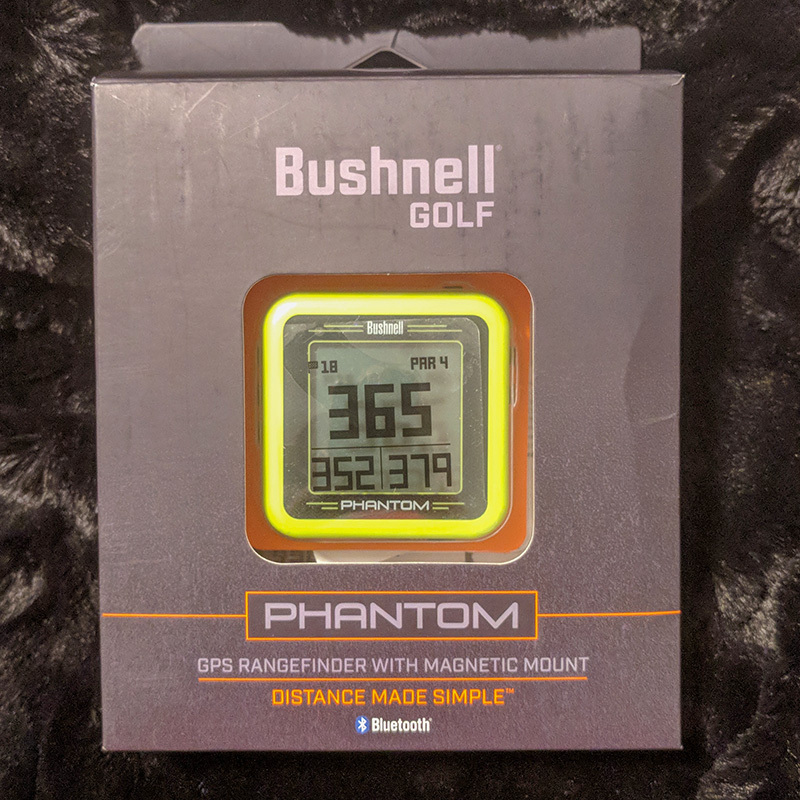 I’m now testing out the new Bushnell Phantom GPS Rangefinder for my full review here at Hooked on Golf Blog. I reviewed its predecessor, the Bushnell NEO a couple of years ago. My first round of testing the Phantom was today, with great results already. I just have to get used to the very powerful magnet on the device. More on that later. Here are a few teaser shots of the Phantom, in action and in retail packaging. Below is the retail packaging. And here’s the course list which pops up when you power the unit up and hit the play golf button. My course was automatically selected. Below shows a little accuracy test. Within two yards either way works for me. 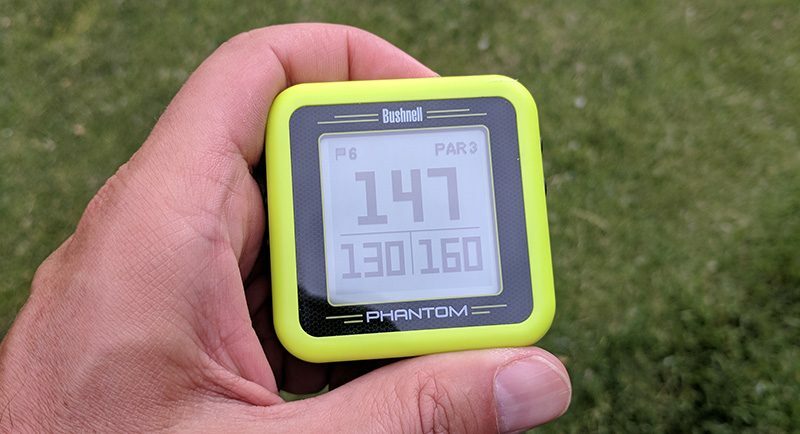 I’ll be posting my review after I have a a fair amount of rounds in the books, but so far I’m digging the Bushnell Phantom GPS. 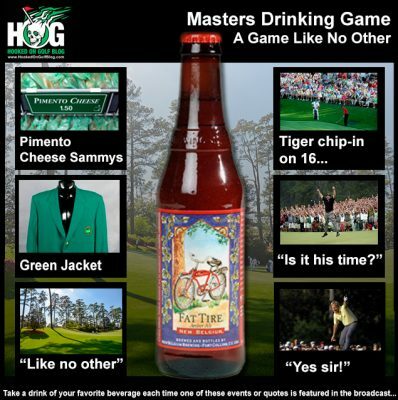 I can already tell this would make a great golf Father’s Day gift. 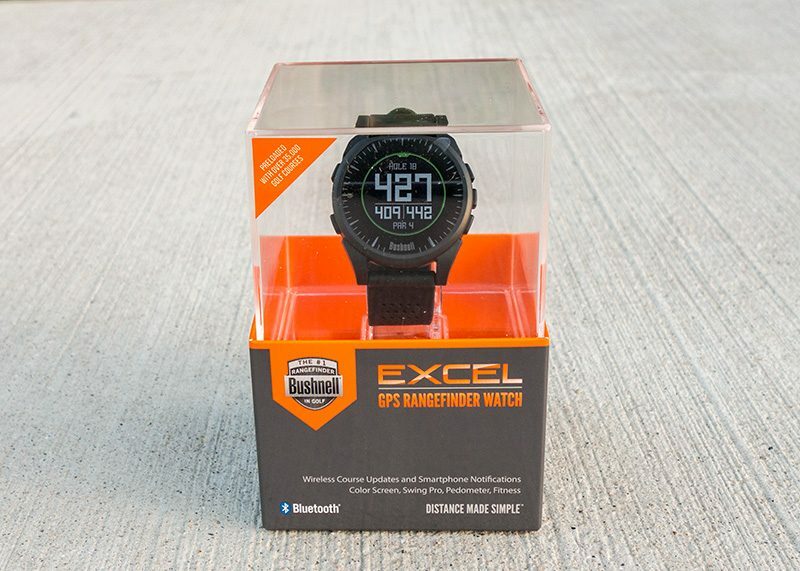 Father’s Day golf gift alert… I’ve just spent a few minutes setting up my new Bushnell Excel GPS Rangefinder Watch, loading the accompanying mobile app, and setting it up on my Google Pixel phone (Android). See photo below. I’ll be starting my testing tomorrow in Wednesday league and posting a review before Father’s Day, hint hint. This is interesting. There are many GPS units on the market. I’ve reviewed a ton of them. Some are stand alone and some are watches. 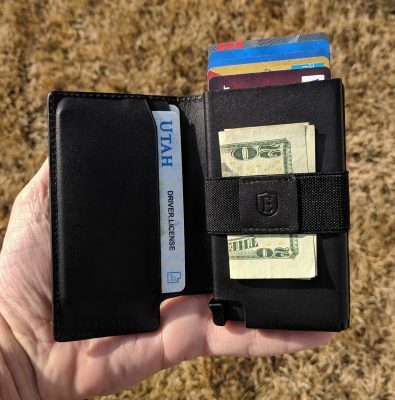 Most are bulky and expensive. The TLink (pictured below) is neither bulky or expensive. The TLink unit saves space by utilizing the GPS in one’s smartphone. 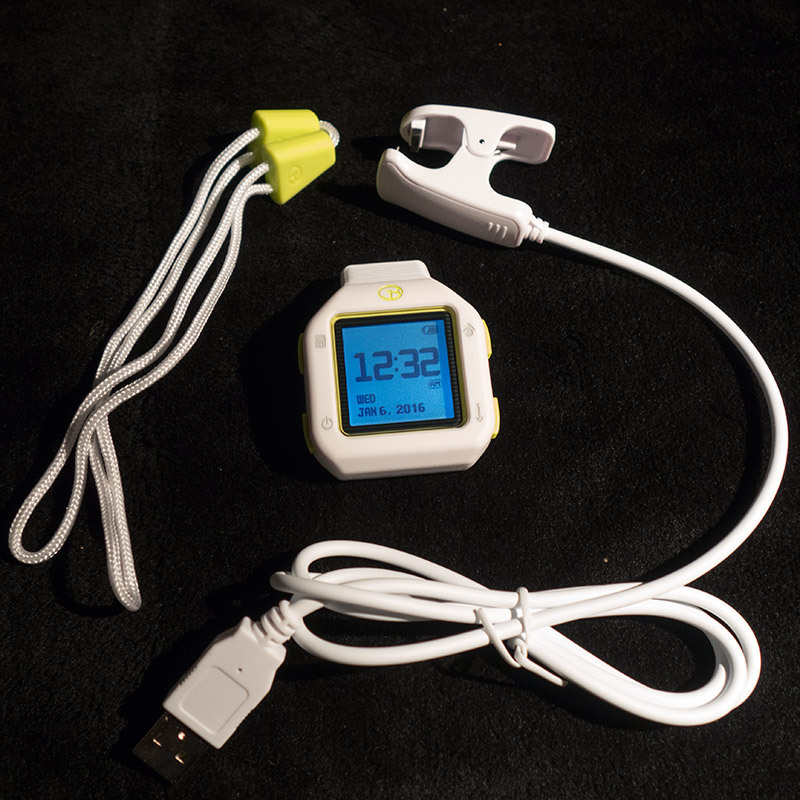 The unit can be worn as a watch with the included band, or clamped onto a belt or pocket via the included clip. 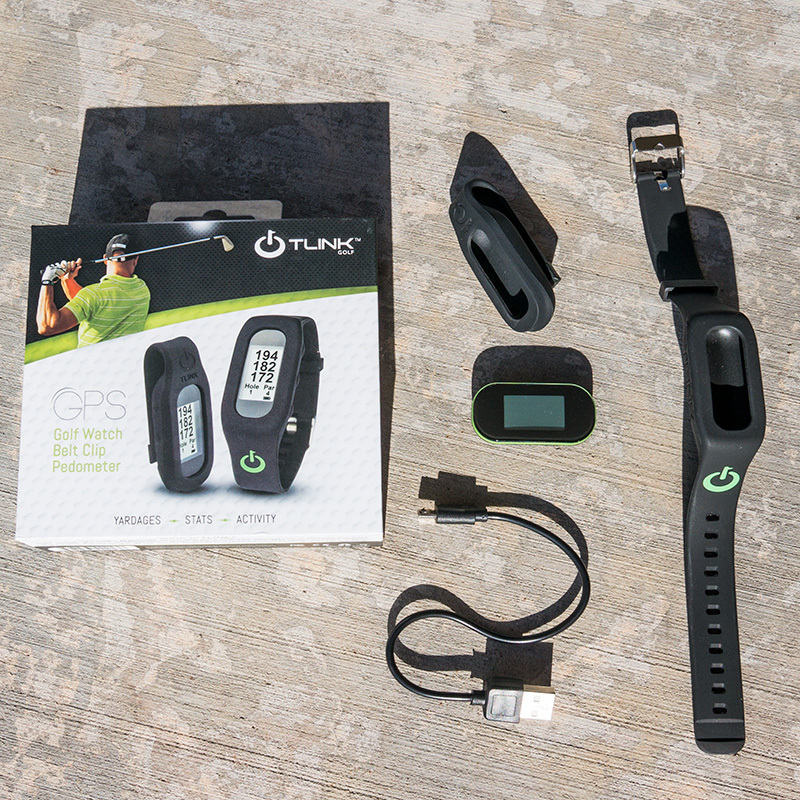 TLink connects via bluetooth to an Android phone or iPhone and uses the phone’s GPS location for yardages, front, back and middle. TLink comes with 30,000 courses built in. You can see if your course of choice is on the list here. The unit also is a pedometer, like a FitBit. It will track your steps (hopefully walking the golf course), distance walked, and calories burned. It will even keep the records for later comparison. So you can see how you did on your home course versus last week’s round. I wish I would have had this when I was in Scotland a couple of weeks ago. 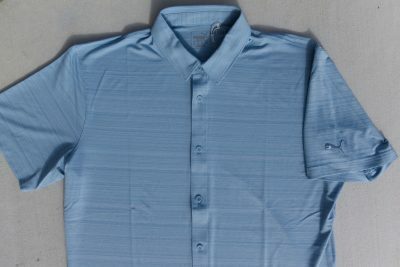 The folks at T-Link reached out to me to do a product review. That’s now in process. They also asked if I would like to offer a discount to HOG readers. Well, of course. I’d love to reward HOG readers with a deal whenever possible. Follow this link to the TLink web store and use the discount coupon code hooked at checkout to knock the price down from $99 to $89. I’m charging up my unit for the first time. I’ll be doing my first round of testing this week. Stay tuned. 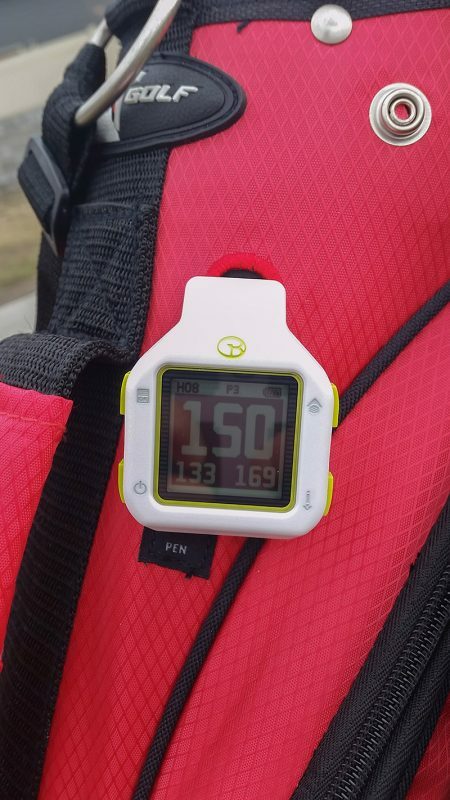 Golf GPS rangefinder watch technology is improving. 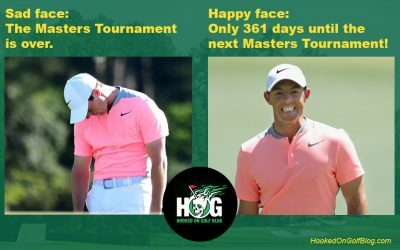 No longer does the golfer have to wear a ridiculously large device to have GPS yardages and other great features on his or her wrist. 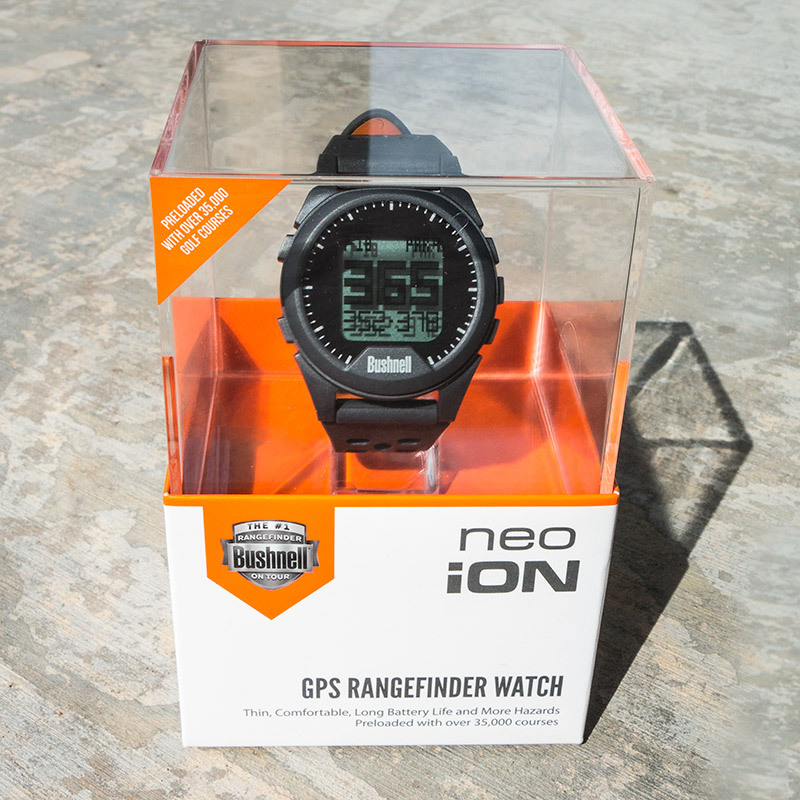 Case in point is the new Bushnell neo iON GPS rangefinder watch. Let’s take a look. 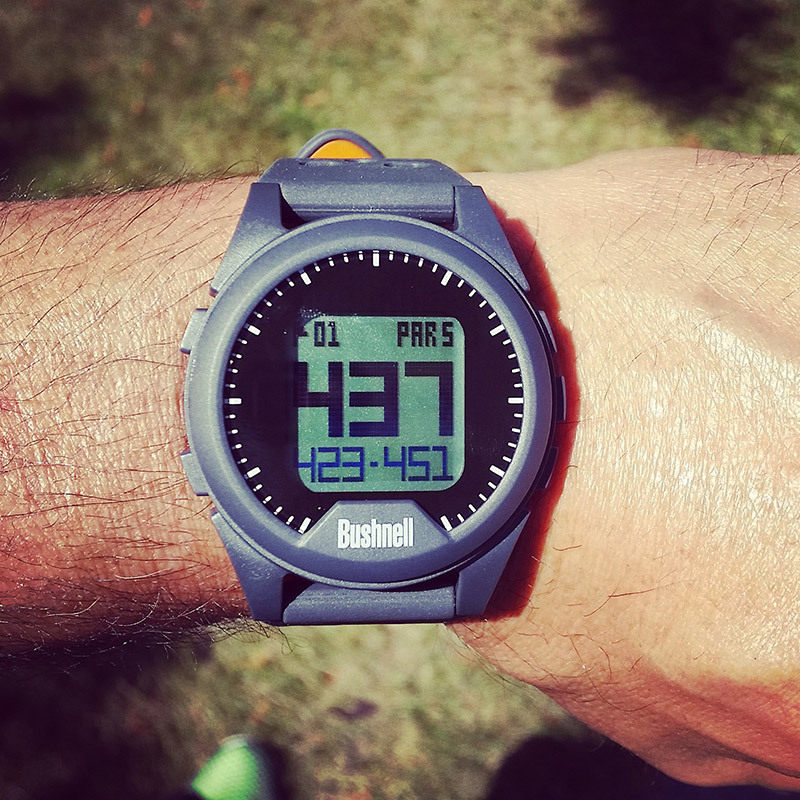 One of the most irritating things about many golf GPS devices, watch or others, is the amount of time it takes them to recognize what course they are on. In fact, some of the GPS units I use never find the course. This unit finds the course very quickly and does not lose it. During the round the yardages are solid and quick. I’ve confirmed them with markers on the ground and via laser. Rock solid. Sometimes it’s better to think about the front or back yardages of the green. Say you have a green with a false front which repels shots. Knowing the right number to avoid that spot is a great advantage. The same goes with pins that are long. If the green has a bad drop behind it or deep rough, long is dead. Knowing these yardages arms the player with great information for a better approach strategy. The pedometer is a very cool feature. My phone has one, but it isn’t as accurate, and it drains the battery badly. Knowing how many miles I’ve walked is also great. A 7,000 yard course may calculate out to four miles, but the walk can be double that or more. After all, the golfer doesn’t hit straight shots. Left. Right. Left. Right. You get the drill. Another great bit of information the unit provides is shot distances. One may “think” their 9-iron goes 140 yards when in reality it goes 132. Knowing exact yardages, and accepting what they really are, will save strokes. If only I could teach myself to accept them… That’s another discussion. The battery life of the iON is great. I’ve squeezed two full rounds out of a unit before charging. I think I could have gotten more out of it but wanted to be sure I had a full 18 for my next round. I have the same critique for this unit which I have for 99% of the golf GPS watches I’ve reviewed, the proprietary charging cable. Why is it so hard for companies to put a standard micro USB plug on these units? That way one could charge it with a standard cable should he/she forget to bring the proprietary one. The other issue I have with GPS watches is the fact that they are watches. I’m not a watch wearer and I find them especially uncomfortable in the golf swing. So I usually attach them to my golf bag. It would be nice if the unit could be stand alone, without the band. Though it retails for $199.00, I’ve found this golf GPS watch on sale at Amazon for only $149.00. Considering all the features and performance this is a great deal. Father’s Day is coming up later this week. Dad would love one. 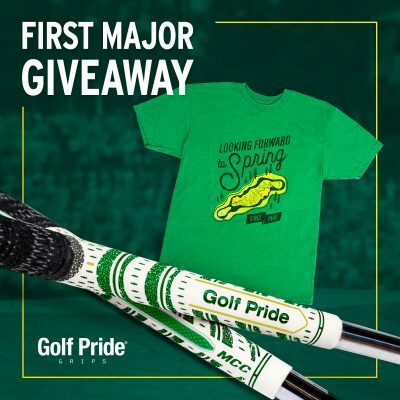 I’m thrilled that the snow has melted and I’m back in the swing of playing golf and testing out/reviewing the latest and greatest golf products. It has been a long winter with the courses closed some 4-5 months here. Today’s review is the great new GolfBuddy CT2 Micro Golf GPS. Mico and watch GPS units are the rage in golf right now and for very good reasons. The golfer has a very small, convenient, and light unit which provides accurate yardages and other nice features. Let’s take a closer look at them all. 17 hour battery life. Play several rounds on one charge. 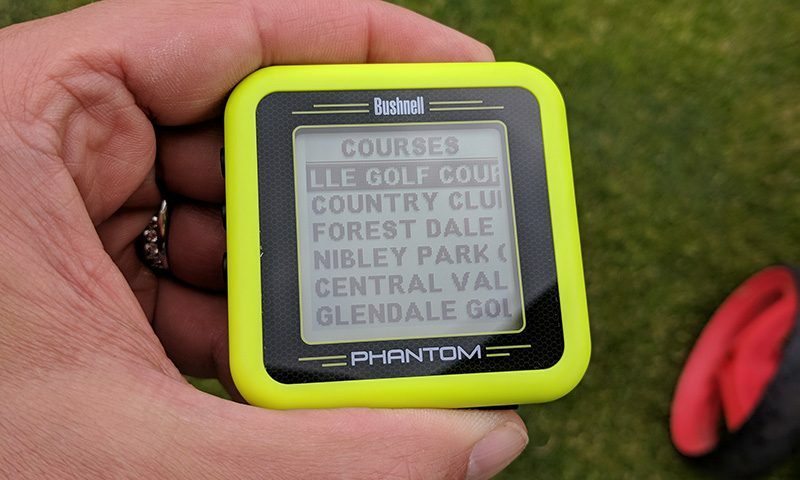 I love how quickly this GPS unit grabs onto the course I’m playing. Some GPS units can seriously take 1-2 holes before they “gain consciousness.” The yardages are fast and accurate. I’ve run this GPS side by side with others and cross referenced with laser rangefinders and the numbers are right on. The size of this unit means carrying it on my person is no problem. I’ll either keep it in a pocket or attach it to my belt or clamp it to my pocket via the very strong clip. Another place I’ll put it is in the pencil holder of my golf bag (first picture). With this GPS unit on my person at all times I always know my numbers. No searching for markers or sprinkler heads and then walking off the numbers. The unit also serves as an electronic scorecard. I’m more into the old school pencil and paper scorecard personally. Below is a short video showing the unit and it’s features. My only critique with the CT2 is the charging cable. It is a proprietary cable you’ll never find at a regular store. If you lose or damage the cable, or forget it on a golf trip, you can’t simply use a standard USB cable to charge the unit. The CT2 is a fantastic micro/portable golf GPS that easily fits in the golfer’s pocket. Of all the golf GPS units I’ve tested to date, the CT2 has the longest battery life by far. The yardages are fast and accurate and the unit finds the right course quickly and easily.